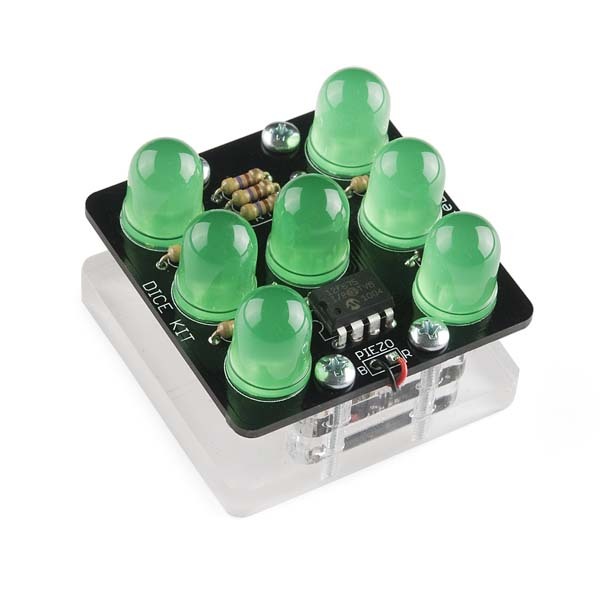 The Dice Kit is a beginner's soldering kit that comes with everything you need to make your own electronic die. When you tap it on the table, it displays a number from 1 to 6 by lighting up the appropriate number of LEDs in the same layout as found on traditional non-electric dice. 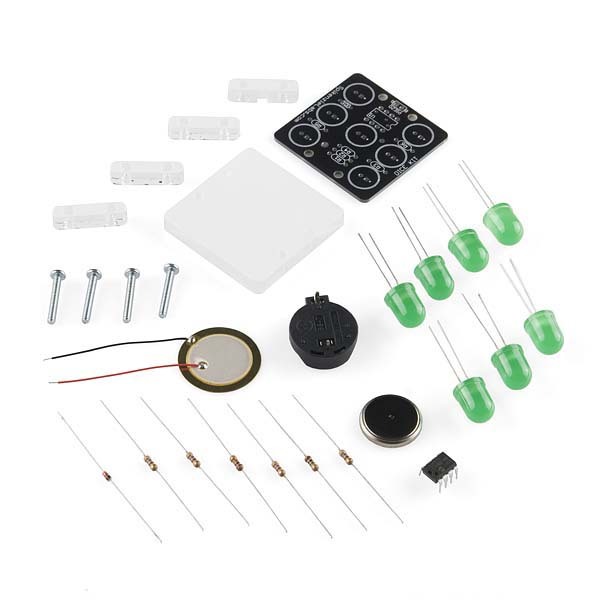 The kit uses a piezo element for detecting the tap on the table and uses a pre-programmed microcontroller. It also includes a laser cut acrylic base and battery. There's no programming required and a beginner can get the kit together in about an hour or so. You will need a soldering iron and basic tools. Also, a dab of glue or double-sided tape is recommended as well. Not to be overly particular but this should be electronic die kit because there's only one. From the build instructions: The name Dice kit sounds a great deal better than âDie Kitâ, so we bent english grammar rules just a little in the name of making a marketable product. I'm trying to refresh my electronics skills. I remember the equation to calculate an LED series resistor as (Vs - Vled)/Iled. How was the LED voltage and current calculated to come up with a 470 ohm resistor? Without knowing the exact part number used for the LED's, it's hard to say. (SparkFun does not manufacture this kit.) My guess is they are using a larger than needed resistor to keep the total current down in the PIC and/or to preserve battery life. The LED's are bright enough even at this low current. I just finished building 16 of these with an after school group of 12 year olds. They all did a great job with their first soldering project, but we had trouble with one kit and I hope someone can help me troubleshoot. The problematic kit works properly except that the LED in the lower right corner lights less brightly than the rest. I checked the solder joints and they are all nice, full and bright. I guess the only thing to do is to swap out that LED for another one. Judging from the schematics, that does seem like the only possibility - unless the other LED it is paired with actually burns brighter than the rest (and the other one subsequently less bright) in which case that would be the one to replace. Thanks. I wonder, is there any possible way that the "bad" LED could glow at all if it was installed backward? With these large LEDs there is no visual way to tell anode from cathode once the leads are clipped, so I was thinking that perhaps if the LED was reversed, it might be glowing slightly when it is in the "off" state. I've ordered a handful of spare green 10 mm LEDs. But I won't get them until after school is out for the summer. I hate to send the kid home with a malfunctioning project. I'm hesitating to just pull the LED and flip it because I don't want to do too much soldering and resoldering on the board. But if it is likely that reversed polarity would result in the behavior I'm seeing, it would be worth it to try. If you'd rather not wait and don't mind a bit of soldering - the kid in question might find the process interesting anyway - there's one thing you can try; swap it out for the one in the middle. If the bottom right remains darker, I am mistaken - although I wouldn't immediately know what to pinpoint as the culprit (incorrect PIC timing seems unlikely, especially since your other 15 builds don't exhibit this problem) - and you're basically back to the current situation. If the bottom right is now the proper intensity, but the middle appears darker, then the LED is indeed at fault.. but being in the middle it won't look quite as out of place. Thanks again. I wrote in a hurry and I wasn't clear in expressing my conjecture. What I meant was: Is it possible that when the LED in question is supposed to be "OFF" (That is, when the PIC switches it off) might there be a reverse current induced in the circuit that causes a reversed LED to glow slightly. My hesitation about removing the LED and switching it around is not that I am afraid of soldering, it is that my twelve-year-olds already got the boards pretty hot in learning how to solder and I am worried that too much more mucking around may compromise the PCB traces. Yeah, I understand your concern wrt the PCB traces :) I suppose in theory there might be, but the other thing is that when this is the case, it should actually light up brighter when its paired LED is lit (or both would be dim). If you look at the schematic, the LEDs are basically connected so that each LED in the pairs of LEDs can be driven individually by either setting the left side high and the right side low, or the left side low and the right side high. So if both LEDs are installed the same way around, one of those conditions would light both LEDs up, and the other would have both be dark, and the faces of the die would not look correct :) This pairing is the reason why you can't really adjust the resistor for just the bottom-right LED, it would also affect the current through another LED. Also, I learned that while this dice kit does switch to an extremely low current state after 15 seconds of non use, and should run for years on the supplied battery, it is quite possible to wear the battery down much faster. Just carry it around in your back pack for a couple of weeks. I think I managed to keep my sample in the awakened state continuously for about 6 weeks before it died. I found a cold solder joint for the battery holder; the hard to reach pin adjacent to the PIC. Go figure :) Glad it's working properly now, though! can i replace the pezio with a push button? Is it possible to substitute in the 950nm LEDs? It is for a NIR camera experiment. You can substitute any LED that has a lead spacing of 0.1" and a forward voltage well below 3V. Ideally they should also be a high efficiency type because of the low drive current. So the COM-09349 950nm IR LED should work fine. Because the LEDs are strobed, you can't use "intelligent" LEDs (LEDs that shift colors or flicker automatically). Also, depending on how fast your NIR camera is, it the strobe effect might be a problem for your experiment. Is the output an evenly random number, or is it weighted, or...? Just curious how useful a pair of these could be for gaming instead of dice. This dice kit is programmed to [attempt to] produce absolutely random numbers; that is, each roll is completely independent of any previous rolls. As a result [over a very large number of rolls] the number of times each value (1,2,3,4,5,6) occurs will be statistically equal and the correlation between all sequences of throws will be statistically equal to zero, where "statistically equal" means that any difference is within a credible interval. For use in gaming these electronic dice should be better than mechanical dice because they can remove the possibility of the throwing skill of the person from affecting the result. But either kind of dice could be "weighted" (a.k.a. "loaded dice") in order to cheat, and it would probably be easier to detect this by examination when using mechanical dice. I ran my double-dice mod through a 10,000 roll test and got satisfactory distribution and correlation results. I suppose a robot could be built to tap the original dice and tabulate the results, but that would probably lead to "Arduino Needed" and "Computer Needed". It uses the analog reading from the piezo sensor to generate a number. So theoretically if you hit it with the same intensity you could roll the same number over and over, but I haven't been able to. "No Arduino needed"? Ok, what do you want to bet somebody goes ahead and adds one anyway? 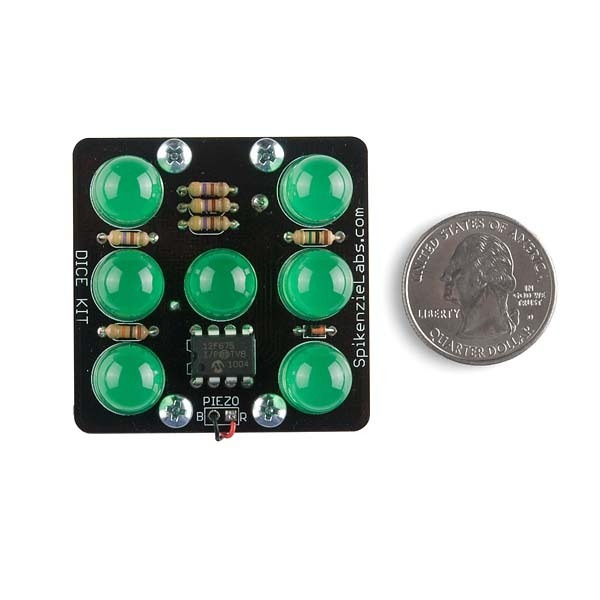 This would be great kit for learning about random number generation and how to write software for a very low power device, not just how to solder. Except it looks like they haven't made the source code available. So here's some code that I hacked together to get you started: http://www.fearlessnight.com/spikenzielabs-dice-kit/index.html There is also information there on how you might modify your kit's hardware to improve it's performance too. 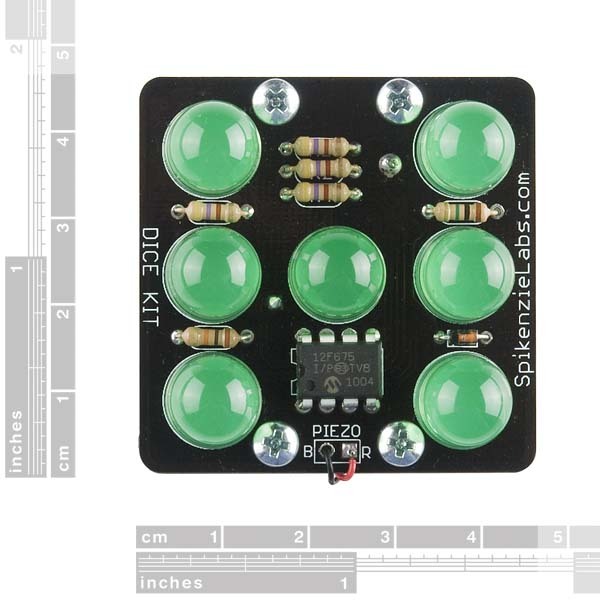 BTW, the completed dice kit dimensions are: 1.75" x 1.75" x 1.3"
Hey SFE folks, is there any way you could add a photo of the finished unit with the PCB separated from the acrylic base so we can see how the piezo sits relative to the battery? I think you can separate (unscrew) the pieces without disconnecting any wires, right? You are correct. See the "Assembly Guide" link above; it contains the picture that you are looking for. Is this possible to hack to program it? Easy assembly. Nice base and supports. I prefer the acrylic over other dice kits that use PCB for top and bottom with metal supports. Bought two and I need to buy two more once they come back in stock. Easy to assemble. It worked well... for 5 minutes, then died forever.